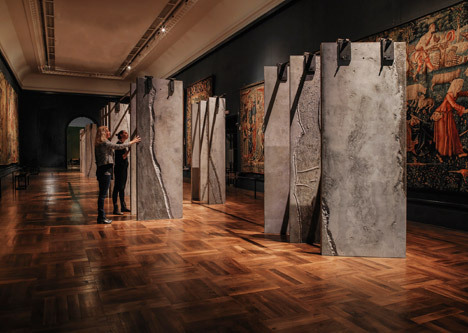 London Design Festival 2015: Dublin studio Grafton Architects has installed rows of textured concrete monoliths inside the V&A museum's tapestry gallery, referencing an ancient script and prehistoric standing stones. Grafton Architects worked with materials specialists Graphic Relief to create The Ogham Wall – 23 freestanding rectangular columns that stand in the dark gallery. The project takes its name from the Irish Ogham alphabet, used on monuments and manuscripts from 4th to the 9th century AD. Its symbols are made up of perpendicular and crossing angled lines, which informed the layout of Grafton's installation. "In the script, each letter refers to a native Irish tree," said Grafton director Yvonne Farrell. "What we wanted to do was take the script and translate it into something that had architectural presence." 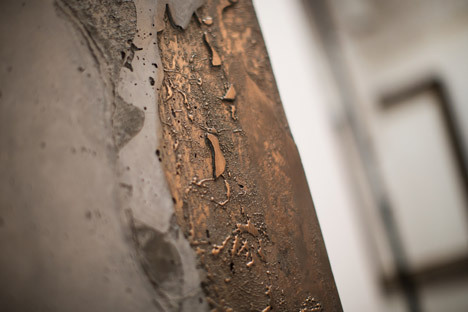 Textures and shapes cast into the surfaces with metal powder are based on photographs of these different species of tree, including silver fir, birch, elder and holly. 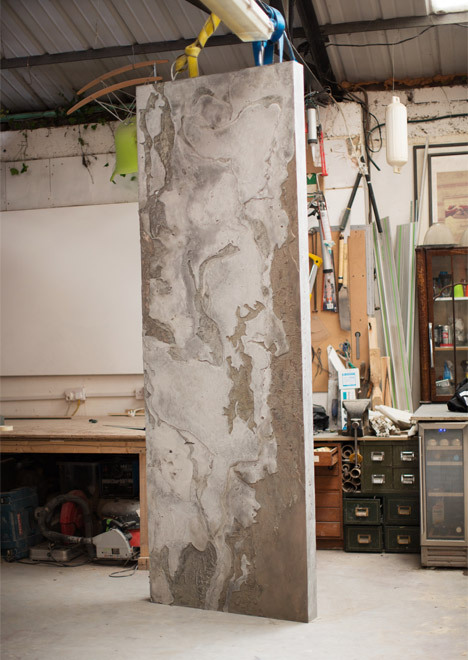 The concrete columns also reference prehistoric stone monuments like Stonehenge in England and Drombeg Stone Circle in Ireland. Grafton has previously used concrete as the dominant material for the Universita Luigi Bocconi in Milan, which was named World Building of the Year in 2008. The blocks in The Ogham Wall each measure 2.7 metres tall but have varying widths. They are arranged in two lines – some are clustered together in pairs or small groups, while others stand alone. The tops are held in place by metal bracing elements to stop them from toppling over and creating "a domino effect". Groupings were created to frame views of the tapestries that hang from the walls of the gallery, which Farrell described as "the televisions of the 15th century". Although they appear to be made of solid concrete, the pillars are hollow and filled with foam. The heaviest weighs 400 kilograms, while the lightest come in at 250 kilograms. Visitors are encouraged to walk between them and touch the material to heighten their experience of the space. "Touch is an undervalued physical reality and we want to encourage the haptic sense," said Farrell. "Each piece has a personality and you might hide from someone between them, and your voice changes when between them. It's like a miniature exercise in architecture." 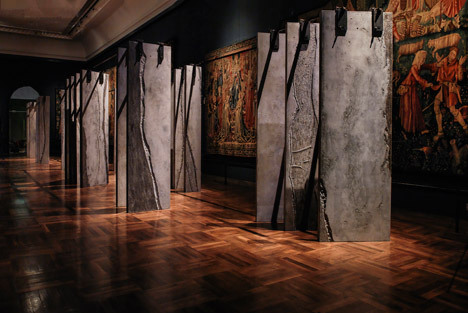 The Ogham Wall forms part of the Irish Design 2015 programme of international events, which also included an exhibition of work by the country's designers during Milan design week in April. It was installed for this year's London Design Festival, which takes place from 19 to 27 September 2015. As a hub for the event, the V&A is also hosting a giant crystal zoetrope, a tower of tiny ceramic shops and a series of mirrored platforms in different locations around the building. 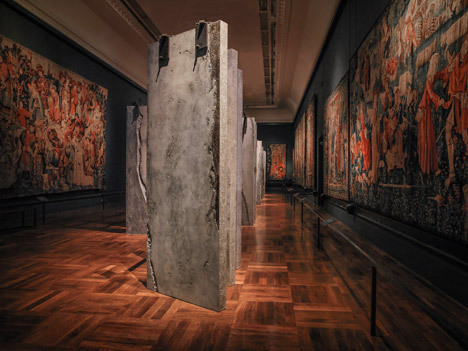 The post Grafton Architects stands concrete columns in rows to create The Ogham Wall at the V&A appeared first on Dezeen.